Today is Ascension Day. In many communities, shops will be closed and Amish will spend the day resting, visiting, and spending time with family. Amish mark many of the same religious and secular holidays that other Americans do. But they also observe holidays that are not as widely celebrated. You’ll find five of them below (note: observance may vary between communities). This day marks Jesus’ bodily ascension into heaven. It’s a movable holiday, dependent on the date of Easter Sunday. According to various sources including firsthand input from our readers, this day seems to be observed in most Amish communities. These include Lancaster County, Holmes County, northern Indiana, Ethridge, TN, Conewango Valley, NY, and a number of smaller communities. One group which does not appear to observe Ascension Day are the Swiss Amish. Since the Swiss have a different set of customs from other Amish, this is not exactly surprising. Other churches that observe Ascension Day in some form include Roman Catholics, Anglicans, United Methodists, and the Eastern Orthodox church. An “old Continental practice”, the second day of Christmas is still observed in European countries including Germany, the United Kingdom, Poland, and Scandinavian countries. usually one of relaxation or visiting others. Christmas dinners are a special part of the celebration, These are usually large meals, not unlike those served at weddings, and various groups beside the family will hold get-togethers, such as single women, teachers, and others of like interest. Not to be confused with the day known as Old Christmas or the Epiphany (January 6th). While not technically a holiday, Amish may fast on the off-Sunday falling between Council Service and Communion. The day may vary by community. Amish also undergo fasting on a number of official holidays, including Good Friday and the Epiphany. As in other churches, fasting has spiritual significance for the Amish, and may be accompanied by prayer and devotional readings (see The Amish Way: Patient Faith in a Perilous World, p. 111). This day, like Ascension Day, has a movable date. Pentecost Monday falls on the day after Pentecost, which commemorates the Holy Spirit’s descending upon Jesus’ followers (celebrated seven weeks after Easter Sunday). Also known as Whit Monday, the origin of “Whit” is not clear, but possibly a historical reference to white garments once worn by those newly-baptized on the Whit Sunday feast. 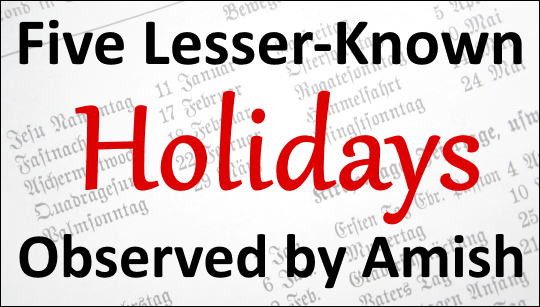 A public holiday in many European and Caribbean countries, and observed to some degree in Catholic and Eastern Orthodox traditions. Another visiting day for Amish. Also called Michaelmas, this Catholic-origin holiday is celebrated in that denomination as the Feast of St. Michael the Archangel. Why do the Amish observe this day? In the old days in Europe, many of the Amish and Mennonites were tenant farmers. Much of the land was owned by the church or aristocrats. Farmers paid a percent of their profits to the landholder every year. The date set by the churches and monasteries in Germany for the farmers to pay their tax was St. Michael’s Day, October 11th. This date fell after the harvest, when the profits and resulting tax could be most accurately assessed. Today, most of the Amish probably couldn’t even tell you who St. Michael is, or why his day was chosen for fasting and resting. Yet it remains a special day for them, as it was for their ancestors, even if the reason for its observance has changed. It is an example of an old custom that has continued to survive simply because it has become a tradition. In Western traditions, such as Lutheran and Catholic, the day falls on September 29, while the Greek Orthodox mark it on November 8th. These of course aren’t the only important days Amish observe. 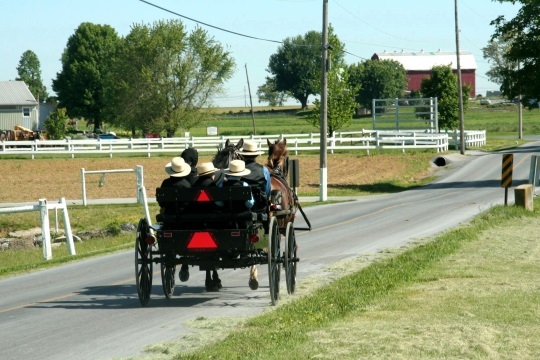 What other Amish holidays or special-day traditions do you know? 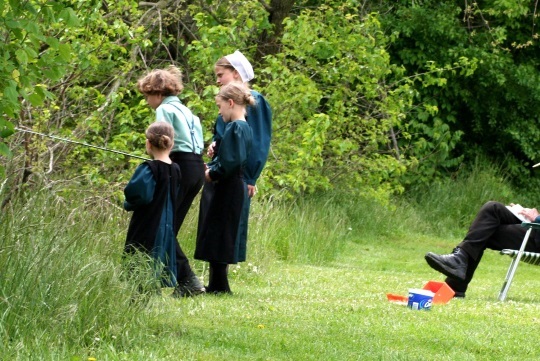 Image credits: Children fishing & family in buggy – Ed C.
Never heard of St Michael’s Day. That’s a new one for me. H-m-m . Never heard of St. Michael’s Day. Do the Amish in PA celebrate it ? Because here in Holmes we never have. Also never heard of second Christmas, tho we usually have the day off work and school as an extension of the Christmas holiday. We do celebrate Old Christmas or Epiphany as most call it.We have fast day, too.The forenoon is for prayer & fasting to REALLY remember the true meaning of Christmas . Lance, I don’t know which community you’re talking about , but here in Holmes we have Fast Day on Ascension and we do go visiting on Fast Days. We also have Fast Days at other times like Good Friday or to unite the whole church in prayer for a certain need,etc. On Fast Day we really only fast in the forenoon. Some church districts will have services on Ascension or Good Friday, the not have services on that Sunday. Is St. Michael's Day a Lancaster tradition? Brad Igou who wrote a piece on it is based in Lancaster County and so that’s likely the case. In the community I was in, 3 of your days were not observed, #’s 2, 4, & 5. Never heard of no holiday on Oct 11th. Pentecost Monday was not observed because Easter Monday was not, either. Both are inventions of man based on misreading of the Bible, I believe. I asked once about second Christmas and they asked, what’s that? So, they never heard of that one either. Such are the vagarities of congregationalism. However, regular Christmas was a holiday, but old Christmas was a holy day. Ascension day would be a holiday. Holidays are days of rest, visiting, socializing, etc. Holy days are days of solemn prayer, Bible reading, and often fasting, spent entirely at home. You would never be traveling or away from home on a holy day. If you need to visit a Amish person, the day before or after a holy day are real good bets that they will be home. Just don’t go on the holy day. Our Amish friends here is WI celebrate the Ascension. I think mostly with a day off work or school, and will most likely visit like they do on an off Sunday. Whether they have church or not I don’t really know. Maybe some ex Amish readers will know the details of the day. My Swiss Amish friends celebrate Ascention Day at least in some measure. And they are some of the more (but not most) conservative. Women wear black caps, they have only open buggies, etc. But it is an important day to them, and I don’t think they have much crossover with the other Old Orders.(i.e. Lagrange County. )A world of difference there!! !